With their lush, green foliage and graceful white blooms, peace lilies are not only lovely to look at, but they’re also one of the easiest houseplants to care for. They thrive in indoor settings and don’t need a lot of sunlight, watering, or feeding, as you can see from the following summary of how to care for a peace lily houseplant. Peace lilies are known to be some of the easiest houseplants to take care of. But there are plenty of fascinating facts to learn about these tropical beauties as well as important information that you should know about. The peace lily is a perennial evergreen that belongs to the genus Spathiphyllum, which is a member of the Araceae family containing about 40 species of flowering plants. Relatives in the Araceae family include calla lilies, anthuriums, and philodendrons. In their native tropical rainforests of the Americas and southeastern Asia, the peace lily grows in consistently humid conditions on the forest floor, where it receives dappled sunlight that filters down through the thick canopy above. Despite the name, peace lilies aren’t actually lilies. True lilies grow from bulbs and produce large, colorful, multi-petal flowers that feature prominent stamens at the center. In contrast, peace lilies grow from rhizomes, which are actually modified stems that usually grow below the surface of the soil from which both roots and plant shoots develop. On top of that, those elegant white blooms that peace lilies put out aren’t actually flowers. Rather, they are spathes, which are a specific type of bract, or modified leaf. These large, hood-like sheaths enclose a fleshy, green or yellowish flower spike called a spadix that bears the small, not-very-flowery looking flowers that are typical of plants in the Araceae family. With such insignificant flowers, it’s up to the lily-white spathes to attract pollinators to the plant. While they come in a variety of types and sizes, the standard peace lily houseplant reaches to about 3 feet (1 meter) high. The large, glossy leaves of the peace lily are usually deep green in color, although there are variegated varieties that have splashes or stripes of cream. In nature, peace lilies grow in rainforest soils that are well draining and enriched by lots of decaying matter. So for peace lily houseplants, use a loamy, well-draining potting mixture that’s rich in organic matter. A blend of peat-based potting soil containing composted bark with some sand or perlite will hold moisture and nutrients while allowing the plant roots access to plenty of oxygen. Alternatively, you can use a pre-made houseplant potting mix. See my recommended equipment and materials section for the potting mix I like to use. 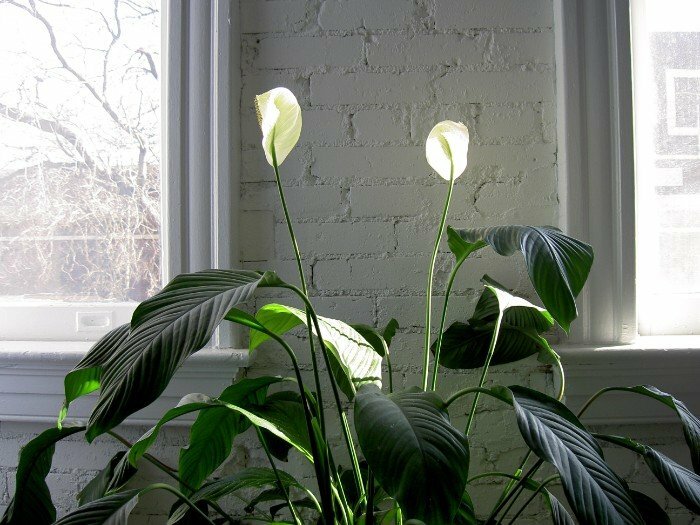 Peace lilies prefer bright shade conditions, meaning they should be placed in a well-lit location that doesn’t receive direct sunlight. Set your peace lily 6-8 feet away from a window that lets in some sunlight during the day. Or place it a bit closer to a sunny window with sheer curtains. Although the peace lily will survive in low-light conditions, this will weaken the plant and sap it of the energy it needs to produce blooms. Since peace lilies hail from the tropics, they need warm temperatures in the range of 65-85 °F (18-30 °C). This is the same temperature range that we commonly maintain in our homes and other indoor environments, which is one of the reasons peace lily houseplants are so easy to care for. Just make sure your peace plant is not exposed to cold drafts from exterior doors and windows. In tropical rainforests, the level known as the forest floor, where peace lilies grow, remains very humid because the thick layers of plant life above block solar radiation. This prevents daily temperature changes and the resulting transfer of water to the atmosphere that normally occurs in more exposed areas. Additionally, there isn’t a lot of air movement in this highly protected zone to help dissipate the moisture. 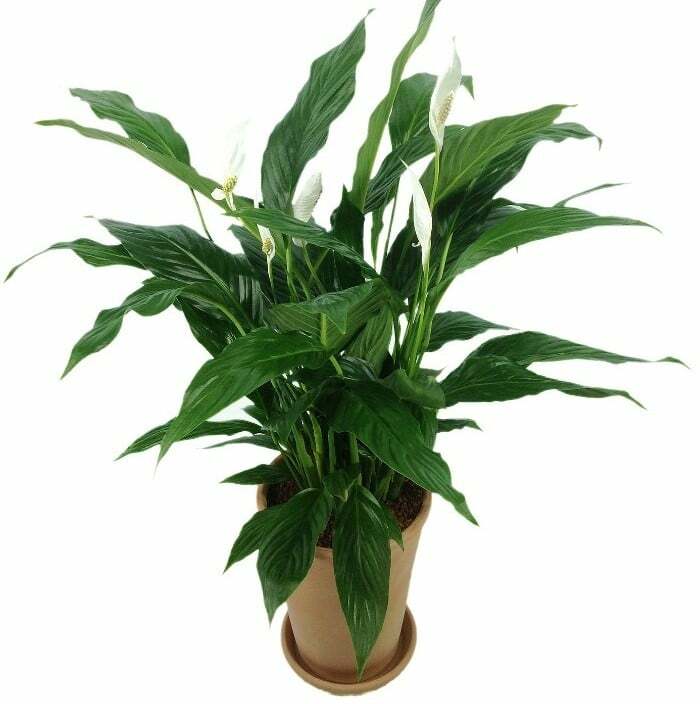 Peace lily leaves are specially adapted to handle high humidity. Their glossy finish and pointed tips, which are sometimes referred to as drip tips, cause water to run off the leaves rather than collecting there and inviting fungus and rot. To mimic the environment of a tropical rainforest floor, mist the leaves of your peace lily plant several times a week – especially during the summer growing season. Also, protect your peace lily houseplant from any and all air currents, which have a drying effect that will deprive the plant of the high humidity these plants crave. The peace lily’s need for high humidity does not mean it needs a lot of water in its soil as well. While tropical rainforests do receive a great deal of rainfall, the well-draining soils in these regions allow the water to percolate down and away from the root zone, so plant roots remain healthy and free of root rot and diseases caused by too much moisture. For peace lily houseplants, wait until the potting soil has dried out before watering. It’s often recommended that you aim to water these plants about once a week. However, since the time it takes for a plant’s soil to dry out varies according to factors such as the current weather, climactic conditions, and growing phase of the plant as well as the condition of the potting soil, the size of the pot, and the size of the plant, it’s best to always check the soil for dryness before watering. It’s easy enough to do this by either poking your finger down into the soil, using an implement such as a chopstick to poke into the soil, or lifting the pot to get a sense of when it feels light as compared to how it feels when you picked it up just after watering. Another common peace lily watering recommendation is to wait until you see the plant leaves start to droop and be sure to water immediately, once your peace lily signals you that it’s ready for another drink. But be aware that too much moisture in the soil can also cause a peace lily to droop, so again, testing the soil is always best. When you water, moisten the soil thoroughly and then allow the excess water to drain away, being sure never to leave the pot sitting in water for more than about 15 minutes. Peace lilies are sensitive to chemicals, including the chemicals that are typically found in tap water such as chlorine and fluoride. So to avoid harming your plant, use purified water, filtered or de-chlorinated tap water, or captured rainwater. You can easily de-chlorinate your tap water by simply leave it sitting at room temperature in an open container for 24 hours to allow the chlorine to evaporate away. You can further prevent harmful chemical salts from building up in the potting soil by setting the plant in a sink and flushing it with pure, clean water every few months. 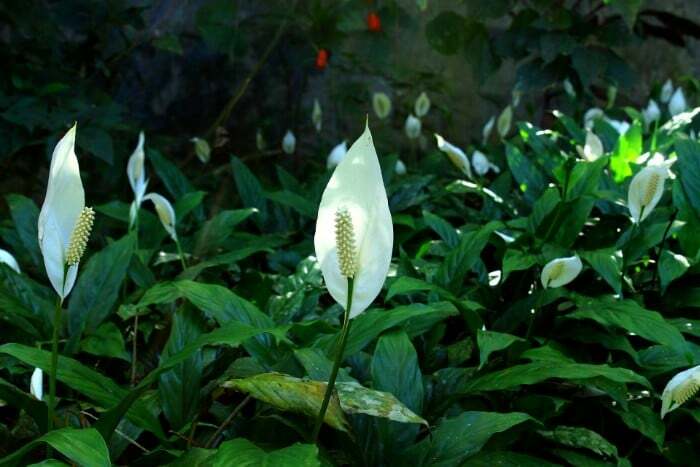 Peace lilies are also sensitive to other chemicals besides chlorine, so be cautious with fertilizers. You don’t really need to fertilize a peace lily to grow a healthy, thriving plant. But if you want to encourage it to produce larger, more vibrant blooms, feed the plant once a month during the spring and summer growing season with a balanced fertilizer diluted to 1/2 or 1/4 strength. But don’t fertilize peace lilies at all during the fall and winter. See this article for my recommended houseplant fertilizer. Peace lily houseplants should be repotted every 1-2 years. Signs that your plant has outgrown its container include crowded plant stalks, crowded roots that are visible at the surface of the potting soil, yellowing leaves, and the plant needing to be watered more frequently. When choosing a new pot for your plant, keep in mind that the roots of the peace lily prefer to be somewhat tightly packed, and they may react badly to suddenly having too much space in a pot that’s too big. Also, always make sure to pick one that has drainage holes in the bottom. Look for a pot that is about 2 inches (5 cm) larger in diameter than the one it has outgrown, with the largest size you should need being a 10-inch (25-cm) pot. If you are planting newly separated sections of an existing plant (see the next section on propagating peace lilies), go with small pots of no more than about 6 inches (15 cm). It will take a while for the roots to become established enough to hold up a repotted peace lily, so use a stake to support your plant until it is able to stand up on its own. When inserting the stake into the potting soil, be careful not to damage the plant’s roots. The easiest way to propagate a new peace lily is by plant division, or rhizome separation. This type of plant propagation is also sometimes described as separation of the plant crown, which is the part of the plant that grows above ground. As the peace lily matures, the “mother” plant produces new rhizomes that have their own roots and clusters of foliage that grow directly out of the soil alongside the main part of the plant. To create new peace lily houseplants from a single mother plant, start by removing the whole plant, including the root ball, from its pot. Next, divide the plant by gently pulling sections of the crown away from the mother plant, taking the time to carefully disentangle the roots, if you can. Although some breakage is inevitable, you want to avoid it as much as possible. However, with more mature plants or plants that have become root bound, you may need to cut the sections away using a sharp, clean knife. Importantly, each section must have at least two leaves as well as having roots attached. Once you have your new sections separated, remove any loose roots as well as any leaves with brown tips, plant them in appropriately sized pots, stake them, and water them thoroughly, waiting for at least two months before fertilizing. If your new peace lilies wilt, don’t worry: It’s just the plants reacting to stress. Peace lilies are very resilient, so if you take good care of them, they will soon recover. To prevent dust buildup on the leaves of your peace lily houseplant, wipe them down with a damp cloth or give the plant a shower with tepid water every few months. Not only does this bring out the glossy shine of the foliage, but it also helps the plant conduct photosynthesis more efficiently. If you are wiping the leaves, just use water and resist the temptation to use commercial leaf shining products, as these will clog up the pores through which the plant breathes and weaken the plant. Peace lilies are generally unbothered by common houseplant insects such as spider mites, mealy bugs, and aphids, although it’s best to take preventative action against them, just to make sure. Regularly wiping down the leaves with a damp cloth works great, especially if you take the opportunity to inspect your plant for the first signs of bugs, which include brown spots, white webs, and sticky slime, so you can wipe them away with rubbing alcohol before the infestation gets out of control. The other issue to look out for with peace lily houseplants is fungus. A gray fuzz on the surface of the potting soil may appear, but it isn’t harmful to the plant. You can easily remove it with a sprinkling of cinnamon, which is a natural fungicide. A black coating on the surface of the plant foliage, however, is a serious problem that may require discarding the plant to prevent it from spreading to your other plants, although you can try thoroughly cleaning the entire plant, pruning away the affected leaves, and pouring compost tea diluted with water into the soil to make sure you don’t have any residual spores. Be sure to wear gloves, and keep the plant quarantined until you are confident that you got the job done. As is common throughout the Araceae plant family, all parts of the peace lily contain needle-like crystals of calcium oxalate known as raphides. These crystals are considered to be toxic to people and animals. If ingested in large enough amounts, raphides can cause irritation to the mouth, tongue, and throat that may lead to excessive drooling, throat swelling, difficulty breathing, a burning sensation, stomach upset, and vomiting. Although these possible symptoms may be alarming, know that the peace lily is considered to be only mildly toxic. Furthermore, it’s unlikely that enough of the plant will be ingested to cause severe problems because the irritating effects to the mouth are immediate, which is very effective in preventing animals and children from going beyond that first nibble. To avoid any worry about these toxic effects, keep peace lily houseplants out of reach of small children and curious pets. On a similar note, since the sap of the peace plant can also be irritating to the skin, use gloves. If you feel a burning or itching sensation after skin contact with a peace lily, washing with soap and water is effective in bringing relief. Additionally, be sure to clean your tools with soap and water and then wipe them down with rubbing alcohol after use on your peace lily plant. 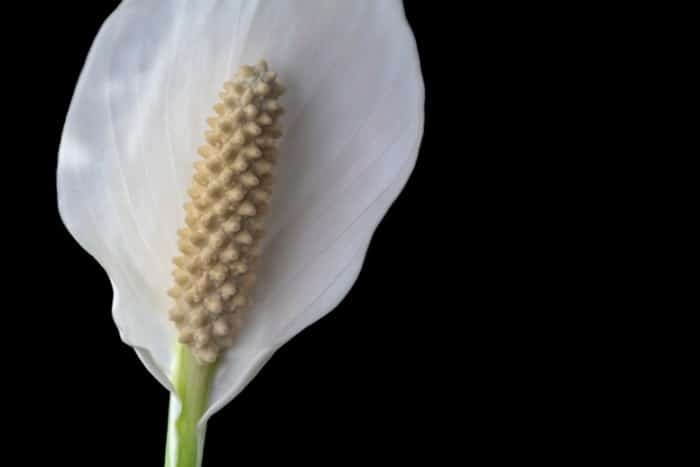 When we talk about peace lily blooms, we’re actually referring to the showy white spathes or bracts rather than to the small flowers that appear on the spadix. These blooms last anywhere from a couple of weeks up to several months. When the blooms begin to turn green and wilt, prune this part of the plant back, cutting the stalk off as far down as possible. This will redirect the plant’s energy away from the bloom and toward the production of healthy roots and foliage. If your peace lily houseplant is refusing to bloom, it’s most likely because the plant isn’t getting enough light. Move it to a location that receives brighter indirect sunlight, or install a full-spectrum fluorescent light to encourage flowering. If your peace lily is getting plenty of light and still isn’t blooming – or if it is blooming, but the blooms it is producing are meager or frail – it’s likely due to a lack of phosphorous. So if you haven’t been fertilizing your plant, start feeding it according to the guidance outlined here. And if you have been fertilizing your plant, then try switching to a fertilizer that’s made for flowering plants, which will have a higher phosphorous content. However, be careful that you don’t go overboard with the fertilizer. If your peace lily houseplant is producing only green spathes, it’s a sign that you are over-fertilizing. Cut back on the amount of fertilizer you are giving the plant by as much as half. And remember that you should never fertilize these plants during the fall and winter. Another issue that can prevent a peace lily houseplant from blooming is the size of the pot it’s in. These plants prefer to be somewhat root bound in their pots and will be healthier and have more energy for blooming when this is the case, so make sure you haven’t placed your peace lily in a pot that’s too big. How Often Do Peace Lily Houseplants Bloom? In nature, peace lilies bloom in late winter or early summer, triggered by the increase in the amount of sunlight each day brings, and the earliest cultivars used as houseplants carried on this habit. However, newer hybrids have been developed that will produce more blooms over a longer period, given that they are healthy and receive plenty of bright indirect light. What Are The Most Popular Peace Lily Houseplant Varieties? Most peace lily houseplants today are varieties of the species Spathiphyllum wallisii, with many cultivars being hybrids. The species is named after the German plant collector Gustav Wallis, who first introduced the peace lily to the European market in the late nineteenth century upon discovering it growing in the wilds of Central America. What Is Another Name For A Peace Lily? 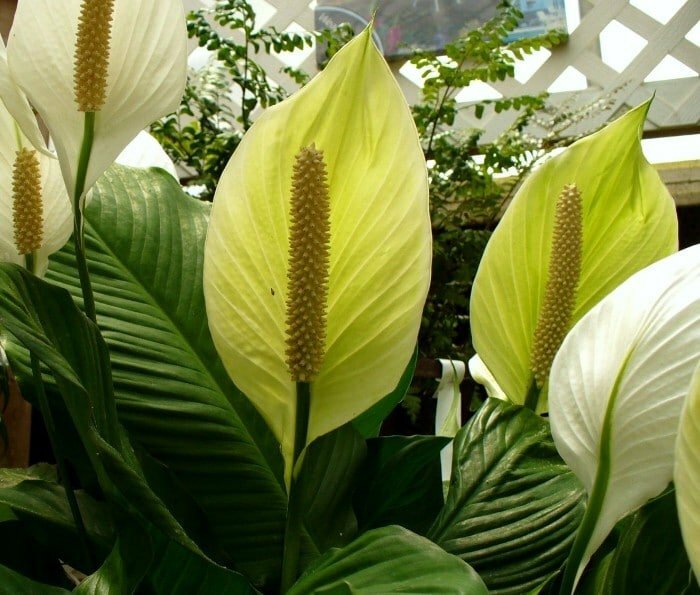 Besides peace lily, these plants may also be known by the names spathe flower, white sails, snowflower, or simply by the genus name Spathiphyllum. Why Are The Leaves Turning Yellow On My Peace Lily? Over-watering: Yellowing leaves often indicates problems due to over-watering.If you are not allowing the soil to dry out between waterings, you are drowning the plant’s roots, which will lead to root rot and disease.Immediately repot your plant in fresh soil, making sure to remove any slimy or unhealthy looking roots. Too much light: Leaf burn from too much light also results in yellowing leaves, so consider moving the plant to a shadier spot. Under-watering: If yellowing leaves is accompanied by wilting and dry soil, it’s a sign that the plant isn’t getting enough water. Peace lily houseplants generally need to be watered about once a week, but individual circumstances vary, so you should be checking the soil more often to make sure you are providing water when the plant needs it. Why Are The Tips Of My Peace Lily’s Leaves Turning Brown? Low humidity:Increase the humidity by misting more often, installing a humidifier, or placing the plant on a humidity tray made by placing pebbles in a shallow dish containing water. Also, make sure the plant is not exposed to any air currents from drafts or room fans. Salt buildup in the potting soil: Salts from chemicals in fertilizers as well as the chlorine and fluoride in tap water can build up in the potting soil and cause the tips of your plant to turn brown. De-chlorinating your tap water or switching to a more pure form of water, cutting back on fertilizer, and flushing the potting soil are all good general practices that could be the key to reversing and preventing this problem. Note that if it’s only the older leaves at the bottom of the plant that are turning brown, it’s a natural growth habit rather than being a sign of any problem. The plant is simply putting its energy into new growth rather than into these leaves that have seen their day. You can safely prune them away to tidy up your plant. 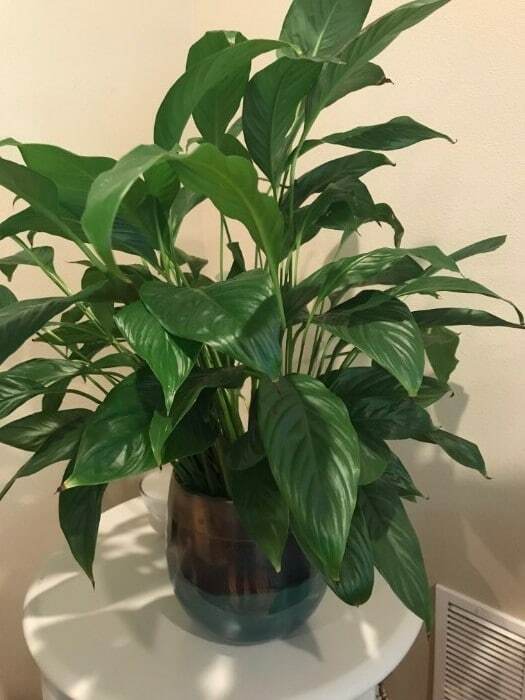 Why Is My Peace Lily Houseplant Drying Out So Quickly? High temperatures: While peace lilies like warm temperatures, too much heat will cause the plant to dry out quickly. So consider moving the plant to a cooler location. Low humidity: If you are watering regularly, adding more water to the soil will cause root rot and thus cause great harm the plant. Follow the tips provided in the previous section to increase the humidity for your peace lily houseplant. Plant is root bound: A plant that has outgrown its pot can’t absorb the water it needs from the potting soil, so check to see if your plant has become root bound. If so, repot it into a pot that’s no more than about 2 inches (5 cm) larger in diameter than the one it’s in. Why Are My Peace Lily’s New Leaves Remaining Small? In addition to yellowing leaves caused by leaf burn, younger leaves that seem to be stunted in their growth are a sign of too much light. 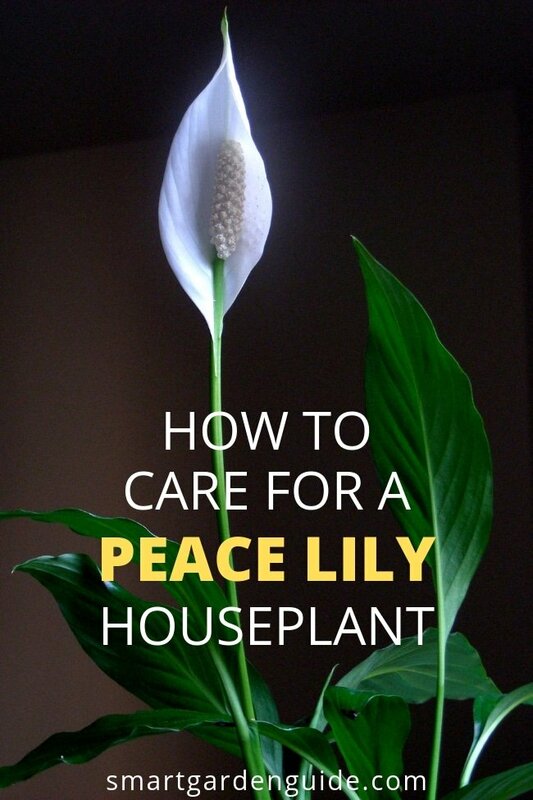 I hope you’ve found this article about peace lily care useful and that your plants stay healthy and thrive. If you’d like to improve your knowledge and enjoyment of growing plants indoors, check out the rest of my articles. 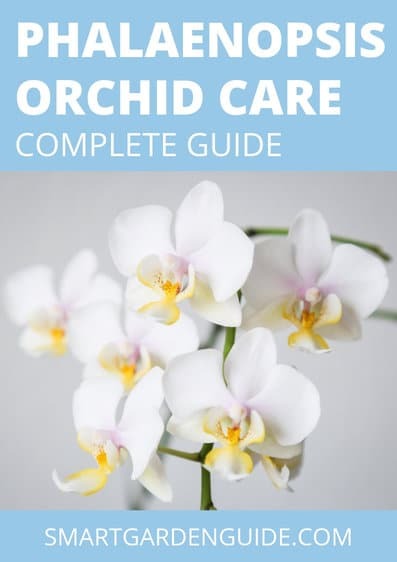 I’ve also got a really useful resources section where I have compiled a list of the best books, tools and resources that can help you to have more success in looking after your plants.